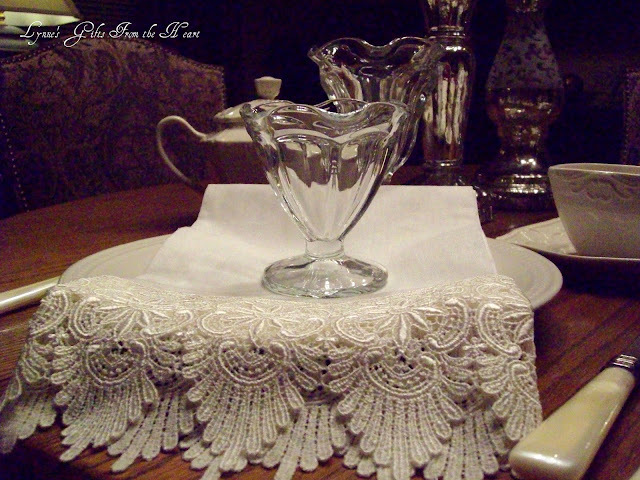 what beautiful lace on the table runner ~ the crystal is so pretty. love it all. hope you weekend in restful. Hard to believe it is the end of October already. :( I just hope this Winter is not as cold as last Winter. Hope you and your family are doing well. Enjoy your weekend. Fall is flying by! Hope to slow myself down and enjoy the next few months! it is sort of bittersweet that summer is over. But time to move on! It's a rainy blustery day here but somehow that's okay with me! It's not cold enough for the furnace to kick on but has just enough of a nip in the air to make it nice! I love October! Hope everything is going well in your little corner of the world! Hi lovely lady. I love your beautiful lace table runner.